London’s parks and gardens are much-loved by Londoners and visitors who are often seeking some sanctuary from the frantic pace of modern life. Whilst London’s parks are well-known, this book ‘Great Gardens of London‘ by Victoria Summerley with photography by Hugo Rittson Thomas and Marianne Majerus illustrates that many of London’s great gardens are relatively unknown. The book’s author, Victoria Summerley is a national newspaper journalist who specialises in writing about gardens and gardening. In 2010, she was the winner of the prestigious Garden Media Guild Journalist of the Year award, and she also writes an award-winning blog. She is ably assisted in the book by two well-known and prestigious photographers, Hugo Rittson Thomas and Marianne Majerus. The author makes the point that “London is a surprisingly green city – roughly 45 per cent of Greater London is green space. ” Most of the green space is parks, commons and heaths, but there is a large number of gardens of all different styles and sizes. From this large number of gardens, the author has selected 30 gardens which she categorises into five sections. The gardens are divided into chapters covering Pomp and Circumstance, Wild in the City, Gardeners’ Worlds, High-Rise Retreats and Private Paradises. In a book that features gardens that are private and others that are open to visitors, the first section is opened by one of the most famous addresses in London. The garden at 10 Downing Street has never been considered a great garden in design, which is surprising considering that William Kent, one of the great 18th century designers was responsible for the transformation of No 10 into a residence. In many ways the garden has been ignored compared to the major events that have taken place in the building, however in the last 30 years the garden has been used to make some major announcements. One of the most dramatic events that directly affected the garden was in 1991 when a IRA mortar bomb landed in the garden which created a crater that is now covered by a Woodland Garden. Winfield House, the US ambassador’s residence in London, Eltham Palace, Strawberry Hill, Hampton Court, Clarence House and the Inner Temple all illustrate the way that gardens often not only reflect their times but more importantly the personal tastes of their owners. Away from the high and mighty, the second chapter explores the Wild in the City which shows that even in the most unlikely places, London gardeners create their little piece of paradise. One of the most original gardens in London is the Downing Roads Floating Gardens in Bermondsey which consists of seven barges planted with trees, shrubs and perennials. Also included in this section is the new planting schemes at the Queen Elizabeth Olympic Park. Horticulture for medicinal purposes and therapy has a long history and the chapter entitled Gardeners’ Worlds lists some of London’s most important health related gardens. The Chelsea Physic Garden in Chelsea and the Royal College of Physicians in Marylebone are perhaps the most famous gardens in this section, however the more recent Thrive project in Battersea Park which provides horticultural training and therapy to gardeners with physical disabilities or mental health issues provides evidence of the importance of gardens for a healthy mind and body. One of the most dramatic recent changes in London has been the high-rise buildings that now dominate the skyline, the chapter entitled High-Rise Retreats provide evidence that roof gardens are becoming more and more popular. Although most of these gardens are contemporary, one of the most remarkable is over 70 years old. The Kensington Roof Gardens in Kensington were created in the 1930s due to the fashion of the time for roof gardens on top of department stores. The department stores may have closed but the Kensington Roof Gardens has survived offering three different styles of garden. The final chapter explores Private Paradises which are often within the more select areas of the city and designed for some of London’s most wealthy citizens. One of the main examples of this type of garden is the Cadogan Place Gardens in Knightsbridge, the gardens have been owned by the Cadogan family for over 300 years. In many ways this has protected the gardens from development but they remain only accessible to the wealthy residents who live around the garden. The final part of the book has a map and details of which of the featured gardens can be visited and when, there is also some suggestions for more gardens to visit. Great Gardens of London is wonderfully attractive and well written book, full of stunning photographs of some of the greatest gardens of the capital. 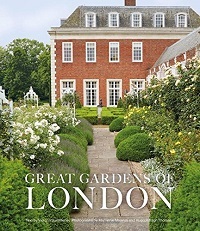 The author suggests the book is aimed at residents and visitors alike, at lovers of both gardens and design, and those curious about London’s history. It will definitely appeal to anyone with a fascination for gardens and illustrates the importance that London’s gardens and parks have playing in providing havens of peace and quiet in an increasingly frenetic modern world. London Visitors is the official blog for the Visiting London Guide .com website. The website was developed to bring practical advice and the latest up to date news and reviews of events in London. Since our launch in 2014, we have attracted thousands of readers each month, the site is constantly updated. By londonvisitors2014 in London Book Review - Non Fiction on November 18, 2015 .